An artful book of deliberately torn, anonymous photographs from the Cold War era leaves many questions unanswered. For some years now there has been a thriving interest and trade in old, discarded photographs of strangers, one of the curious by-products of the ease of access to everything that the Internet delivers. 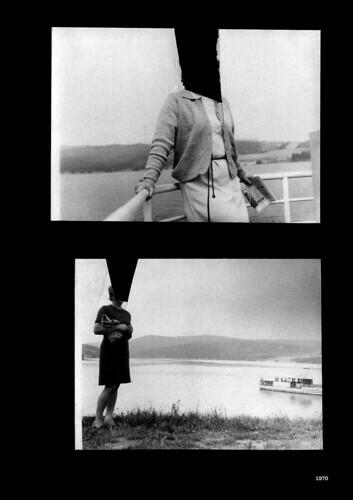 The pictures in Anonym 1968-1984, published by Take Take Take, a Czech design team, bookshop and publisher, were obtained in exactly this way. 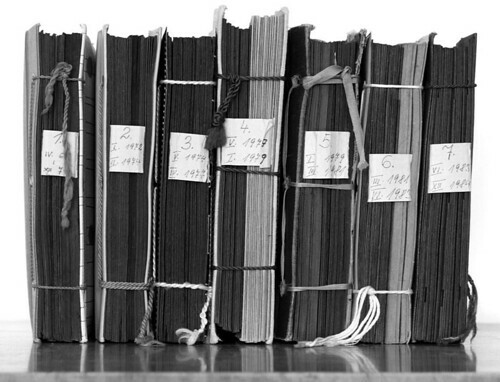 Seven family albums were offered for sale online and the proprietor of Vyšehradskej.cz, a history website, took a chance and bought them. When the albums arrived, the buyer was initially dismayed to find that someone had cut out the faces from every single photograph. More than 700 pictures had been systematically mutilated, a laborious and time-consuming feat, but the albums had otherwise been left intact, with the photos still occupying their original positions on the pages. There was no information about the people shown in the pictures, the photographer (or photographers), or the identity of the person who had felt it necessary to erase their identifying features. Right. The seven anonymous family albums that provided the photos for Anonym 1968-84, designed and published by Take Take Take, 2018. Anonym gathers 161 of the pictures. The book’s conception is credited to Vyšehradskej jezdec – a pseudonym that may be a reference to a group of young pro-western rebels in the 1950s – and it was designed by Take Take Take (Nikola Klímová and Jindřich Janíček), who present the pictures on black backgrounds, as if displayed in an album. The original pages are lighter in colour and textured, and the designers have suppressed these backgrounds, converting the voids created by the incisions into black to unify the collection. 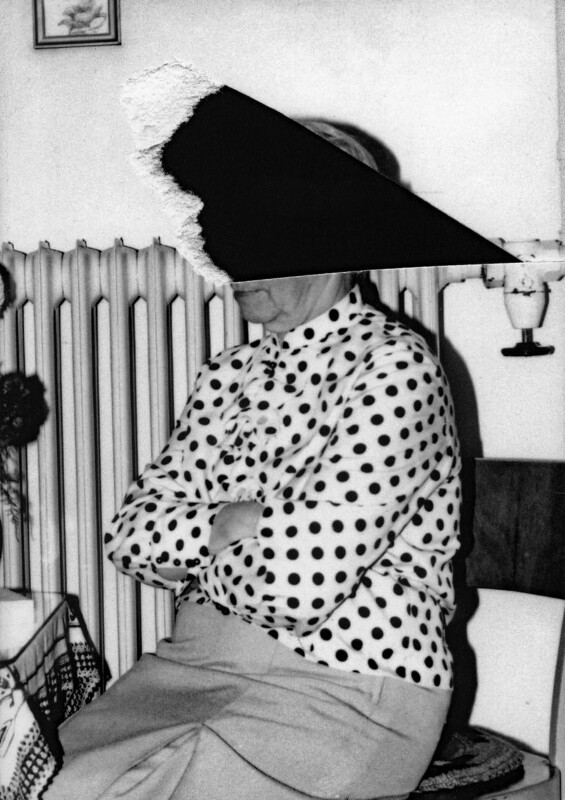 The texture of the originals is expressed through the cover stock, printed with a picture of a middle-aged woman, her face masked by a triangular rip. Right and below. One of the original photographs, plus pages and a spread from Anonym 1968-84. In Camera Lucida, Roland Barthes introduced the concept of the punctum, a detail in a photograph that is particularly poignant and ‘pricks’ the viewer – a ‘sting, speck, cut, little hole’. In Anonym every deletion, every ragged hole in the image, becomes a punctum, their variations in style a source of fascination, even as they leave you slightly unsettled by the incomplete evidence of what you will never be able to know about these images and people. Turning the pages, the feeling of some unnameable catastrophe is hard to shake. Some excisions are straight cuts into the photo from the edge of the picture, while other removals culminate in a final tear, a small moment of impatience that obliterates some of the photograph’s emulsion, leaving the cloudy white base of the paper behind. Where more than one person is shown, the cutter traces a course between them to make a single void that might be more or less straight-sided or angled as required. These areas of emptiness create a graphic relationship between the subjects, uniting them in a visual bond that may or may not have been the case in life. 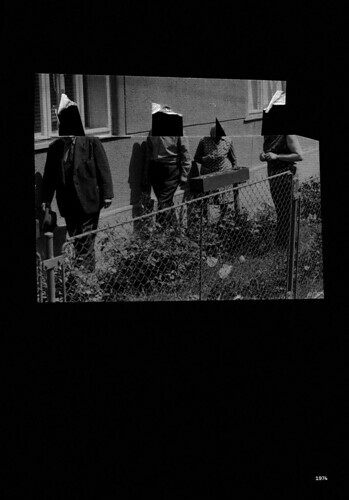 In other photos, individual cuts seem to emphasise the apartness of the figures, as in the four people caught in a narrow channel between a fence and a wall. An incision line stretches between their head spaces like a taut rope. 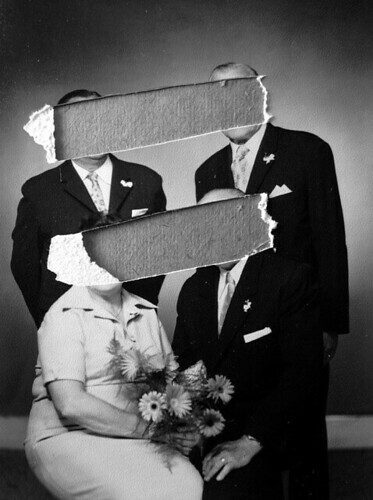 The erasure of identity is always compelling, however it may have come about. Martina Bacigalupo’s Gulu Real Art Studio presents images from Uganda in which the punching out of ID photos has left behind discarded prints of now faceless bodies, recovered by chance from the trash. Erik Kessels’ In almost every picture 14 shows a series of found Polaroids of sunbathers each with a circular hole eradicating most of the subject – the shots were used for making badges. 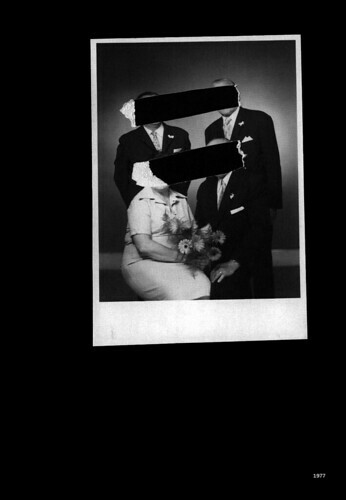 In Anonymous, also published by Kessels, various individuals have defaced their own pictures instead of destroying the entire photo, the only infallible way of preventing an unwanted portrait from one day rearing its head again in this kind of book. The scale, consistency and violence of defacement in Anonym is nevertheless unusual. Clearly, the defacer was close to these men, women and children in some way, sufficiently close to care about concealing their identities, yet not so close as to want to retain the pictures. It would have been possible to destroy the albums entirely. The reluctance to do that once again suggests some degree of feeling. It is hard to annul pictures of people you feel affection for, and a troubling burden to photographically expunge an entire family. But the solution still remains odd. The visual documents of the subjects’ experiences will be allowed to survive – wedding photos, standing in a park, feeding young goats – and there is money to be made from selling their pictures, but future viewers cannot be permitted to see who they are. Or perhaps there was some deeper, more psychological motivation. Could this remarkably dogged wielding of the blade be a form of revenge? Taking a contextual view, Anonym’s makers see the pictures as revealing in another way. They date from a period of ‘normalisation’ in Czech political life when ‘personal identity was systematically suppressed and dissolved in the dullness of an interchangeable backdrop’. Intentionally or not, the ‘censor’ of these photographs has provided an ambiguous commentary on that era. 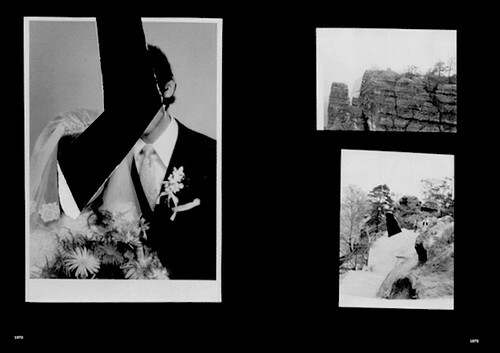 The book ends hauntingly, in 1984, with another wedding couple. From their bearing, they look happy, despite the black hole where their faces should be. So where are they now? See also ‘Lost worlds’, Val Williams’ feature about found photography, in Eye 55.